014 - Mekong Delta, Canals & Sampan Tour - Vietnam - 2014 - John Macs Travel & Photography. 014 - Mekong Delta, Canals & Sampan Tour - Vietnam - 2014. This morning we took The Mekong River Delta Cruise, a fantastic morning cruise along The Mekong River Delta. Continuing on this tour we took a Sampan Ride along secluded waterways with overhanging foliage, penetrating deep into A Labyrinth Of Narrow Waterways, before taking the Mekong River Delta Cruise back to the mainland. Once we arrived back onto the mainland, we stopped off at The Mekong Rest Stop Restaurant for lunch. Such beautiful gardens surrounding the open thatched buildings, the food at this restaurant was excellent. 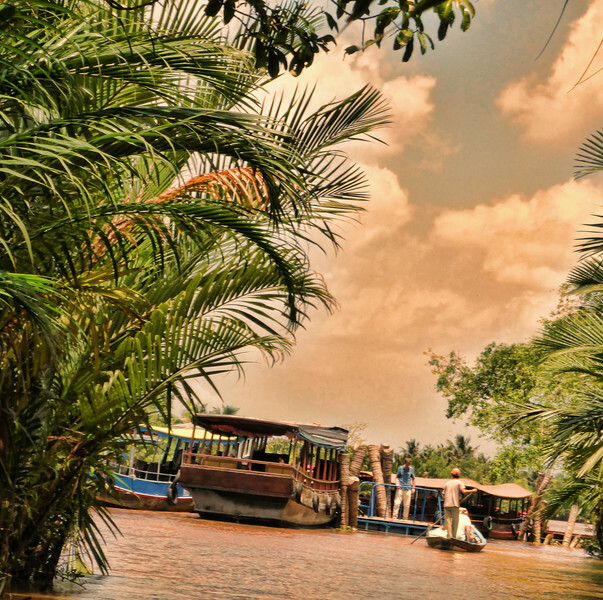 The Mekong Delta Canals, Sampan Tour, Vietnam. - 2014. The Mekong Delta Canals, Sampan Tour, South Western, Vietnam. - 2014.